The Print Shop Is Open! The Printer Printed The Part It Needed! This past weekend my printer showed signs it was slipping. The X axis (which moves the bed back and forth) slipped, which showed in one small piece I printed. It weirded me out, but I passed it off as an anomaly. I printed another piece and it shifted the raft layer a bit. Now I was worried. 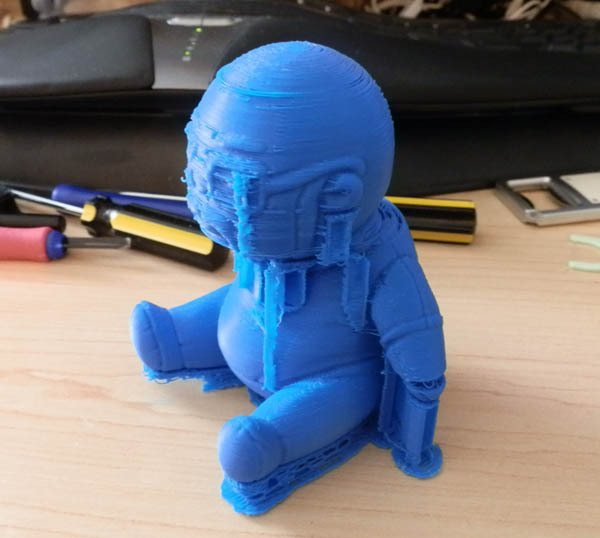 So I printed a couple of other pieces without issue. Then I printed a Plush Russ, which is a model of a plush figure, modeled by one of my co-workers as a caricature of another of my co-workers. This time, 3 hours into a 4 hour print, the bed slipped again. You can see at the neck level the whole print shifted. So I printed it again hoping it would finish. 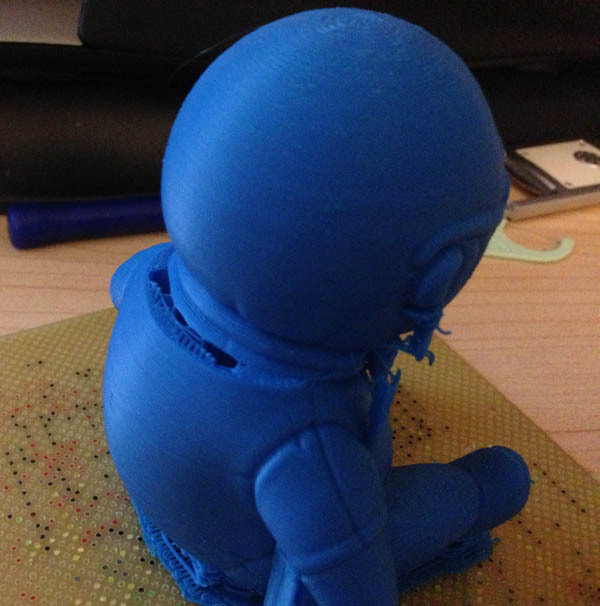 But no… this time it did the same thing at about the same level, only after that, it printed very badly for the rest of the head. Side note: I feel partly responsible for the existence of this document. The printer spent a few weeks on the road last month getting a new bed heating element. When I asked if they had a document on changing one out they said they did not. They had previously sent me a doc on unclogging the print head, but they didn’t have one on replacing the heating element. Ah. Yup. That would do it. 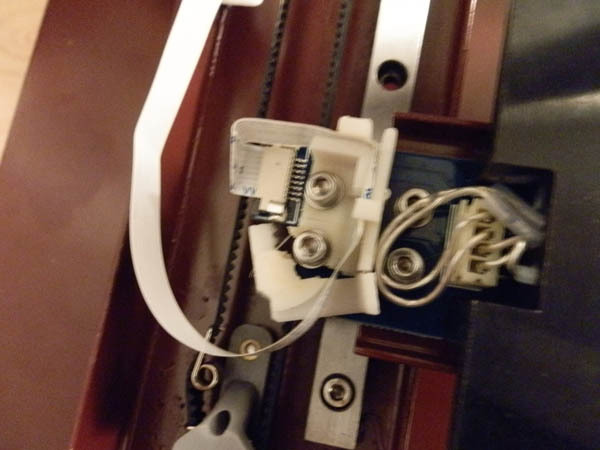 That plastic piece has teeth that grip the belt, sliding the print bed back and forth. It broke. So Afinia said they would send me another one right away, which they did. It is important to note that in the Afinia software directories is a directory filled with spare parts for the Afinia printer. A lot of the internal parts (as well as the protective print head housing and the fan housing and the filament feeder, the reel holder, etc, are modeled and printed on an Afinia printer. Of course I could print my own replacement part. But with this part broken, I couldn’t. But that same day Afinia sent me the part I realized that the break was nice and clean, so I tried a bit of superglue, and the glue held. Nervously I set the printer up and set it to printing this replacement part. It printed! The whole thing. Without issue! So I cleaned up the part, re-opened the printer, and removed the broken part (which was still nice and solidly held by Superglue) and replaced it. That’s right. My printer repaired my printer. Again. So the very next thing I did was print 9 parts that looked to be integral to the function of the printer and put them in my Afinia tool box in case another part breaks. And the replacement part arrived today. Thanks, Afinia! I’ll hold onto that one as well in case I need it. I appreciate your swift, helpful action. Again! I can’t tell you how much I love this machine!